My latest commission is for 6m of bunting .. For you folk with the imperial system, 6m = 6.56 yard, or 236 inches – yep, that is a lot of bunting! My client requested such a large amount in a continuous length, as they’re setting up for a business stall and want bunting all across the roof. 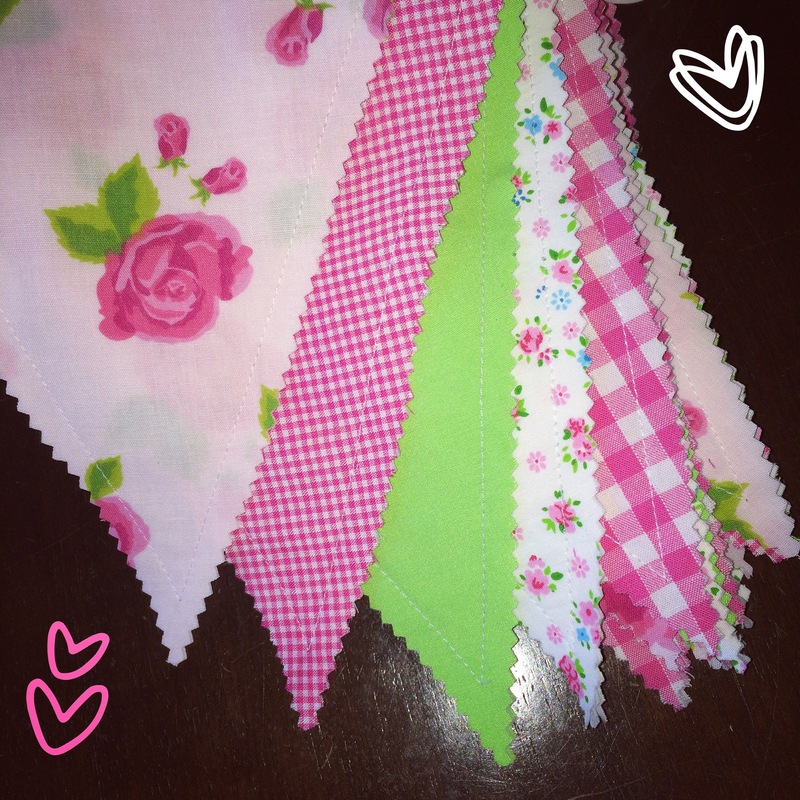 This bunting is double sided, so it’s pretty from all angles! Here’s a photo of it cut and stitched together, with the edged pinked. I thought I’d supply some steps for anyone wanting to make their own bunting. You’ll require fabric, stabiliser (if you fabrics are lightweight), bias binding, and coordinating thread. 1. Pick your fabrics, as many or as few as you’d like. My client gave me 5 fabrics for this bunting. Keep in mind when selecting your bunting that light weight fabrics will require stabiliser to give it some weight. 2. Cut out a template for your bunting. There’s no right or wrong here. You can make it as large or as small as you want. I usually cut my fabric to 6.5″ (w) x 7.5″ (h). 3. With your fabric wrong side to wrong side (pretty side of fabric facing down and up), cut your flags using your template. Remember that 1 flag requires 2 pieces of fabric, assuming you want it double sided. The amount of flags required will depend on what bunting length you require. When measuring, keep in mind whether you would like a gap between the flags. Once again, this is personal preference. For this commission, I used 6 flag per 1m, with no gaps in between the flags. 4. Sew a seam allowance of 0.5″ around the left and right side of the flags – there is no need to stitch the top of the flag as this will be seam when we add the bias binding. Add the stabiliser to the middle of the 2 fabrics when sewing, if required. 5. Pink the edges. I like to leave a fair gap between the edge of the fabric and my stitch line, but you can decrease this gap if you want. If you do this, reduce your seam allowance to 0.25″. 6. Repeat steps 2 to 5 until you have the number of flags required. 7. Take your bias binding and iron it length ways, so there is a crisp mid section for the binding. I find this step really helpful, but it’s one that is really easy to overlook. This mid section will be helpful when you place the bunting to be sewn. 8. Arrange your flags in whatever order you would like. For this commission, I kept the same pattern the whole way through. You could do whatever pattern you’d like though. 9. Once arrange in your desired pattern, place the top of your flags right up into the mid section of your binding. Sew down, and place your next flag in the mid section. When placing your next flag, you can keep a gap, or you can overlap the corner of the bunting slightly. If you keep a gap, make sure it is consistent! I personally like no gaps in my bunting, so I slightly overlap the corners. 10. Get rid of any small off cuts, and iron your bunting – now you’re all finished! Here’s what the bunting looks like all finished. I just wanted to share how cute the packaging for this commission is. It’s like a pizza slice all nicely wrapped and tied with a bow hehe!! Thanks for this directions, Erin!Your buntings are so lovely and inspired me a project…. a tote bag with small buntings…. could be nice…. I love this post! What a lovely blog as well. So cute and LOVE the packaging! Thank you. I agree. I think they go so well together also. I haven’t tried before, but it sounds like it could be a good idea!